New Delhi: Giving a major boost for the farmers’ income, the Cabinet Committee on Economic Affairs has approved the increase in the Minimum Support Prices (MSPs) for all kharif crops for 2018-19 Season. The decision of the CCEA is a historic one as it redeems the promise of the pre-determined principle of fixing the MSPs at a level of at least 150 percent of the cost of production announced by the Union Budget for 2018-19. The Commission for Agricultural Costs and Prices (CACP) has recommended MSPs for all kharif crops broadly in line with the announced principle. The increase in the MSPs of Nigerseed at Rs.1827 per quintal, moong by Rs.1400 per quintal, sunflower seed by Rs.1288 per quintal and cotton by Rs.l 130 per quintal is unprecedented. Amongst cereals and nutri cereals, in terms of absolute increase, MSP of paddy (common) has been raised by Rs 200 per quintal, jowar (hybrid) by Rs 730 per quintal and ragi by Rs 997 per quintal. The highest percentage increase in MSP over the previous year is for ragi (52.47 %) followed by jowar hybrid (42.94%). For pulses, apart from Moong, MSP of arhar (tur) has been raised by Rs 225 per quintal yielding a return over cost by 65.36 per cent and urad by Rs 200 per quintal with a return over cost by 62.89 per cent in order to maintain inter-crop-price parity. Similarly, the MSP of Bajra has been raised by Rs.525 per quintal yielding a return of 96.97 per cent over cost. Return over cost in percentage includes all paid out costs including those incurred on account of hired human labour, bullock labour/machine labour, rent paid for leased in land, expenses incurred on use of material inputs like seeds, fertilizers, manures, irrigation charges, Depreciation on implements and farm miscellaneous expenses, and imputed value of family labour. Promoting cultivation of pulses can help India overcome nutrition insecurity, improve soil fertility by nitrogen fixation and provide income support to farmers. 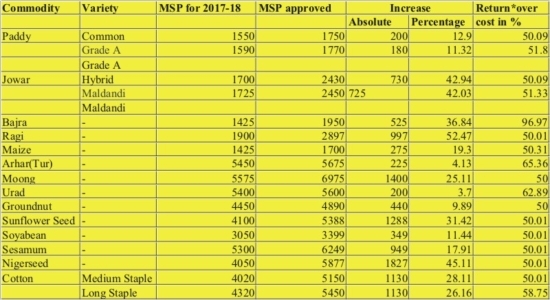 Thus, increased MSPs for pulses will give a price signal to farmers to increase acreage. Further enhanced MSPs would boost production of oilseeds and encourage investment in its productivity and help reduce India’s import bill. Increase in MSPs of nutri-cereals will improve nutritional security and allow farmers to get higher prices. Food Corporation of India (FCI) and other designated State Agencies would continue to provide price support to the farmers in the case of cereals including nutri-cereals. National Agricultural Cooperative Marketing Federation of India Limited (NAFED), FCI, Small Farmers Agri -Business Consortium (SFAC) and other designated Central Agencies would continue to undertake procurement of pulses and oilseeds. Cotton Corporation of India (CCI) will be the central nodal agency for undertaking price support operations for Cotton.